A while ago I saw an idea on pinterest to turn an old spice rack into a rack for nail polish - brilliant, right? So for about eight months whenever I went thrifting I looked for an old spice rack. FINALLY I found one! When we were at my parents' house over Christmas, we took it apart, sanded it, and painted it. (This was a joint effort of my sister Kristin and her husband Matt, Caleb, and myself. But honestly Caleb did most of the work.) I am so happy with how it turned out! Sand the entire spice rack. Spray on primer & spray paint, following directions on cans. And try not to stand as awkwardly as I am. Sherri, this looks so good!!! And I think it's impossible not to stand awkwardly when you're spray painting! Wow the comparison is night and day!!! The new results are awesome! Such a good job! oh my gosh sherri you are so creative. what a great idea and i love goodwill for fantastic finds like the old spice rack! Look at you! Amazing work...I need you to come to my place and liven up some old pieces! Um... you should see how I stand/squat when I spray paint. Love how this turned out. That is one of those amazing before and after photos :) I'm going to pin this! wow, that is awesome! i am tucking this idea away for future use. Awesome job! It's just like they have in the nail salons. Legit! How cool! This turned out fabulous! Have you ever seen those cool things that you attach to the top of a spray paint can that has a handle for spraying? They are really cool! I'am seriously loving this!!! I'm a nail polish junkie!! That is such a cute idea! Did you hang it in your bathroom? Laura - I actually hung it in my closet because for some reason my walk-in closet is bigger than our bathroom! Wow, at first I didn't even think the after was the same rack as the before pic! I really, really need to do this. This looks great! Standing awkwardly while spray painting is the only way to get it done right! That's so cute! I need to find myself an old spice rack pronto. Great job! It looks like it belongs in a pretty salon! This looks so great, Sherri Lynn! I love how organized your polish is in this cute polish rack! You did a great job! Hey, nice! It looks even better with all the nail polish on it. Super cute! I'll be on the lookout for an old spice rack! You did a wonderful job! 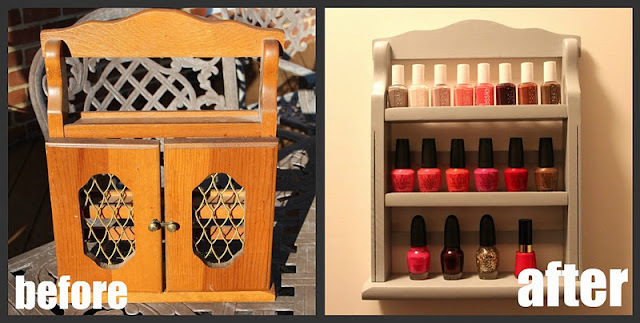 Now you'll have to buy more nail polish since you have such a cute place to store it!